I was pleasantly tuned in to my foodie mode when I decided to do the cooking earlier today. I scoured our freezer for a potential lunch superstar and got myself a pack of pangasius fillet. This type of fish predominantly originates from the Mekong River in Vietnam and is now enjoying immense popularity in certain European countries like France. The fish is branded as the new “darling” of the aquaculture industry as demand for this type of fish is growing by the day. 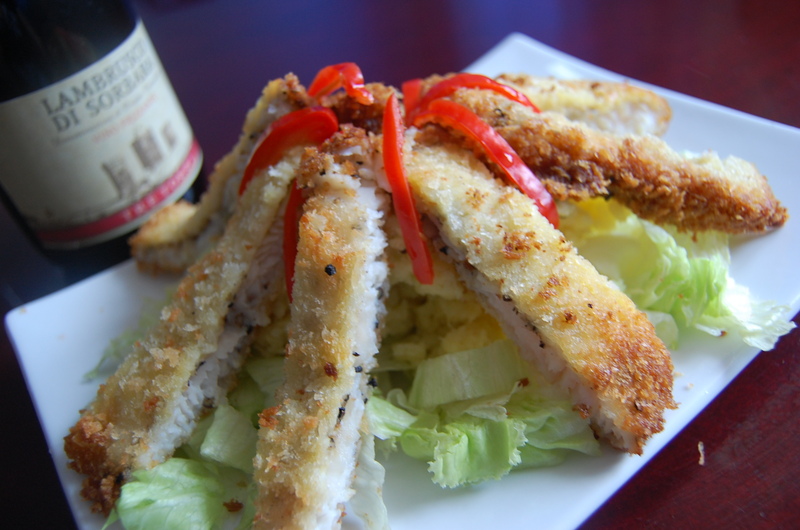 Considered as a “white fish meat” Pangasius is served in a host of restaurants that are both classy and regular. Its meat is used as main ingredient for frying, baking or grilling. Over at my kitchen today, I decided to make my parmesan crusted pangasius fillet. I just seasoned my fillet with salt and lathered it generously with coursely chopped pepper and squeezed into it some lemon juice. I then dipped the fillet into 1 beaten egg before I coated it with japanese breadcrumbs that I combined on equal proportions with my parmesan cheese. Then pan-fried it for four minutes on both sides. Chopped the fillet into finger sized strips. Voila! It is THAT simple to make. If you want to make your plating more attractive, you might want to put a bed of asian salad on your plate then top it with the fillets or bed it with creamy mashed potatoes. Btw, a coupla times I’ve been asked about the secret to a crunchy, tasty, golden-brown colored fillet. There is actually quite a number of recommended methods in coating or breading meats. Personally, I like breading my fillets with japanese breadcrumbs (cheap and readily available in your favorite supermarket). I dip the meat in well-beaten egg then I coat it with japanese breadcrumbs, I press it lightly to make it compact then I let it stand for about three minutes before I pan-fry it. If you want it crunchier and more heaviliy breaded, you might want to dip again the previously coated meat in the beaten egg then coat it again with the japanese breadcrumbs. You may substitute the japanese breadcrumbs with your regular flour or even cornstarch although the texture is not as crunchy. Meantime, make sure your oil is hot enough for frying. The moment you throw in your meat in the pan, immediately reduce flame by about thirty percent to avoid burning the meat and prematurely cooking it. On the other hand, make sure you are not underheating your pan or else your breadcrumbs will disintegrate and flake out from the meat. Dear Caren Yrastorza, thank you for sharing this delicious recipe including a nice picture of it. I am working for a company from the Netherlands that is currently promoting pangasius fish. We would like your permission to use your recipe and picture to promote pangasius. It wil be used to print on a card for handing out and perhaps also on our website. Please let me know if this is ok for you. Sorry for replying so very late. Sure go ahead and use the recpe and photo. May I request to see the finished product? Thanks!